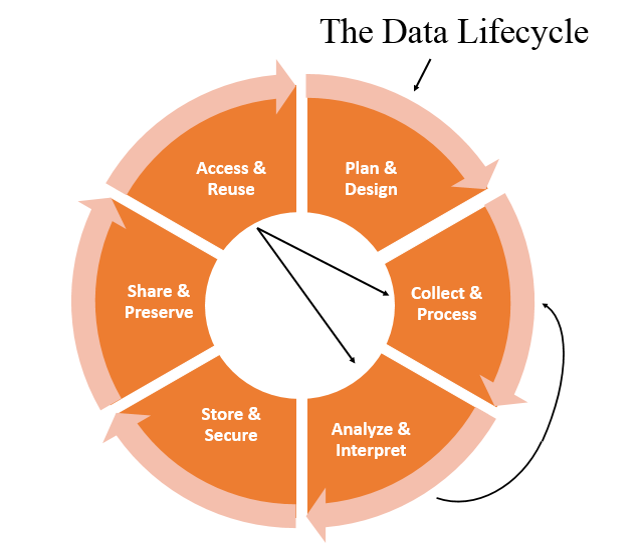 Research data management is an integral part of responsible research practice and involves implementing strategies relevant to all stages of the research data lifecycle. Image source: Adapted from Vellucci, S. Non-Linear Research Data Lifecycle, 2014. Data constitute the core of a research project. Maintaining data reliability is key to ensuring the integrity of data-based conclusions. Without proper data management, the validity of research results can be questioned, jeopardizing not only your own reputation, but also the work of others and the reputation of the University. Also see the Responsible Conduct of Research & Scholarly Activity research guide. When we talk about data in this Toolkit, we are referring to systematically recorded information that is produced as part of a research process and is the basis of research findings. Funders with data sharing and data management policies may have their own definitions. What type of data are you producing? Gather a clear picture of what your data will look like. Is it, for example, numerical data, image data, text sequences, or modeling data? Knowing exactly will inform many decisions you need to make about storage, backups and more. Image data requires a lot of storage space, so you'll want to decide which of your images, if not all, you want to retain, and where such large data sets can be housed. How much data, and at what growth rate? Who is your audience for the data? How will they use the data? The answer to this question will tell you how to structure the data and where to distribute it. Who controls the data (you, UNH, a research center, the funder)? Before you decide how you will manage the data, you need to know if you have the authority to control it or if you have to abide by external requirements. Not all data needs to be retained indefinitely. Figure out what's important to keep long-term and make sure your plan for those datasets is solid. The following guides cover general principles for managing your data, plus selected information related to particular formats or disciplines. The NISO Primer on Research Data Management available from the NISO website. ICPSR Guide to Social Science Data Preparation and Archiving (pdf): Outlines best practices throughout the research process, including applying for a research grant, collecting data, and preparing data for deposit in a public archive. Oak Ridge National Laboratory: Best Practices for Preparing Environmental Data Sets to Share and Archive: Describes the practices to make data sets ready to share with others. UK Data Archive: Create & Manage Data: Provides best practice strategies and methods for creating, preparing and storing shareable datasets. See also Managing and Sharing Data: a Best Practice Guide for Researchers (pdf). Data Management for Data Providers: Best practices from Oak Ridge National Laboratory Distributed Active Archive Center (ORNL DAAC). The Data Management Toolkit is maintained by Patti Condon. It is licensed under a Creative Commons Attribution-ShareAlike 3.0 Unported License.